Toss Shazza out to sea and let your dog be a hero. 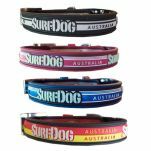 Is your dog destined to be a surf life saver? Here's your chance to see it through! Uniquely Australian, these Surf Dog toys are just super cute. I mean what's cuter than seeing your dog swim back to shore with a little flapping bikini clad person in his mouth? Dogs just love to shake something flapping in their mouths so the flapping makes these dog toys irresistable. Who knows why? All we know is it's a pure joy to watch a dog with a flapping person in his mouth. Made from tough neoprene Surf Dog Bazza and Shazza fetch toys feature a solid rubber ball in the head and feet so they spin as they fly through the air. The balls give Bazza and Shazza a bit of weight for a decent throw and they create buoyancy, flap and bounce. The bright colours are great for water visiblity.